Cotton growers who plan to put the Case IH Module Express 625 harvester to work in their fields this fall have another option to consider: the new Case IH AFS Cotton Yield Monitor. 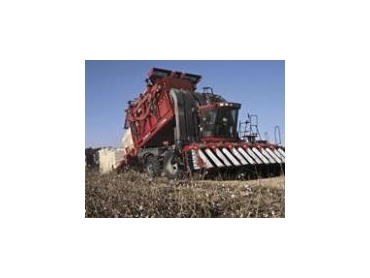 The monitor has an ideal Controller Area Network (CAN)-based optical sensor that provides precise, real-time cotton flow information while harvesting cotton with the Module Express 625. "Tests show that yield data is accurate to within 3 percent of actual gin weights," says Trent Haggard, Case IH Marketing Manager for cotton harvesting. “Growers also can create yield maps to aid future productivity and make informed in-field decisions based on accurate data," he says. Kenneth Hood, a cotton grower and gin operator in Gunnison, Miss., field-tested two 625 Module Express machines equipped with the AFS Cotton Yield Monitor. "The monitor is an excellent part of the Module Express because it lets you know exactly what your yields are in the field. It also displays how much cotton is in the basket so you can plan where to unload the module," Kenneth Hood says. "By planning to unload the module at the end of the field, you don't need a mover to relocate the module to the gin, which involves extra expense of both equipment and personnel." Kenneth Hood, who grows 10,000 acres of cotton, also likes the field-mapping feature of the monitor. "By mapping the field you can figure out the needed inputs for next year, such as fertilization and irrigation. If there are great differences in different areas of the field, you can spot the need for potash or lime," he adds. "The Cotton Yield Monitor helps make more intelligent management decisions." Both the Module Express 625 - the innovative module-building cotton harvester - and the AFS Cotton Yield Monitor recently received the prestigious AE50 award for quality in agricultural equipment design from the American Association of Agricultural and Biological Engineers' Resource Magazine.